In Part three of our three part blog series we will be exploring the extra stuff contract mattress suppliers offer on their mattresses. The first item to choose from is the type of binding. Your choices are inverted seam or tape edge. advantages to inverted seam mattresses. The smooth seam eliminates the ridge that traps dirt and bacteria on traditional mattresses. Additionally, the inverted seam eliminates the primary hiding place for bed bugs. edging involves sewing a firm border around the mattress that becomes part of the mattress cover. Tape edging looks like a fabric ledge around the top on the mattress similar to what you would expect to see on your mattress at home. This type of binding is just as secure as inverted seam and is a more traditional way to finish a mattress. The only real downside is that the border area creates a sort of valley along the mattress that can harbor dust mites and even bed bugs. 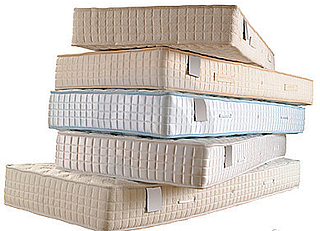 Speaking of bed bugs, mattresses are a prime source of concern when dealing with bed bugs. Bed bugs must feed on humans to survive and the only time humans are stationary enough to be targets is in bed. No mattress is immune to the menace of harboring bed bugs but inverted seam mattresses have been shown to offer fewer hiding spots for bed bugs to nest and breed. Lab tested bed bug proof mattress encasements offer the highest degree of protection from bed bugs (see next bullet point). Ticking, Padding, Pillow Tops and other additional comfort levels are available universally on contract mattresses. As with any commodity, the more comfort measures you request will result in higher costs. Should you want to explore any comfort extras, ask your supplier for more information. The sky’s the limit with comfort-added toppers on almost any style of contract mattress. If you have bariatric concerns there are specialized bariatric mattresses that offer the safety and comfort measures needed for larger individuals. All standard mattress cores will have trouble standing up to the compression of heavier weight but bariatric mattresses are designed to handle the compression and will last longer. Mattresses for contract and group living environments can be one of the most challenging purchases because good sleep is such a vital part of human life. Always work with a reputable contract supplier experienced in group living facilities to ensure that you get exactly what you need at the right price.